This indoor/outdoor, five LNB-nbsp;Ka/Ku-nbsp;line amplifier delivers a 28dB gain and will boost DBS or ATSC off-air signals. The power supply is included.-nbsp;DIRECTV approved. DBS Ka/Ku or ATSC off-air signals are required at multiple locations connected via coax cable. Signal loss must be off -set. 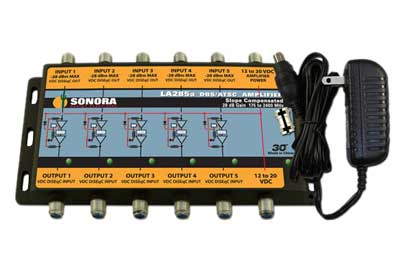 LA145a amplifiers with 14 dB gain are available for smaller distribution systems. LAL205a amplifiers with automatic gain are preferred in cascading systems of more than (2) amplifiers to simplify design and installation.